Jon Ossoff’s campaign to take Georgia’s 6th District for Democrats comes down to the wire. Will the 6th District Swing Left? Georgia’s high-stakes congressional runoff comes down to the wire. 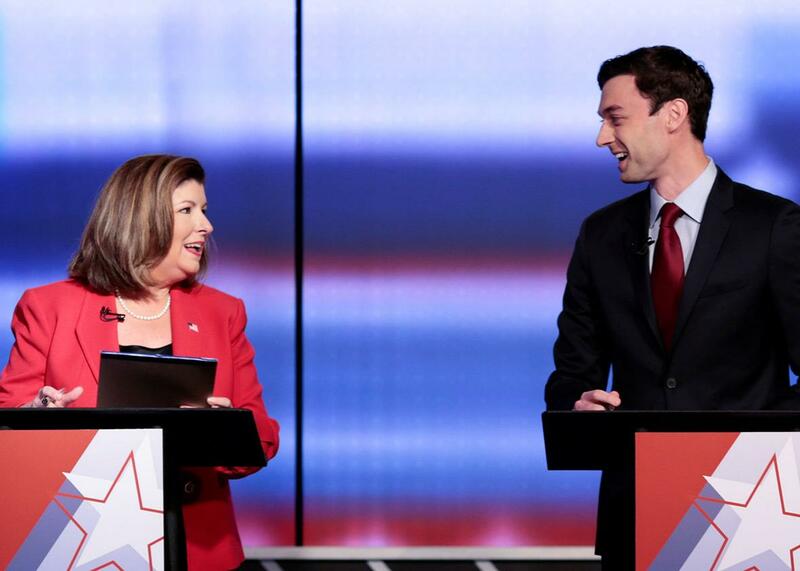 Karen Handel and Jon Ossoff exchange words before Georgia’s 6th Congressional District special election debate in Atlanta on June 6. Last month Jessica Zeigler, a precinct captain for Jon Ossoff’s congressional campaign, realized that reaching millennial voters was almost impossible. Young voters are often registered at their parents’ address, and many of those parents are enraged when Democratic canvassers show up at their door. “Those were the angriest people,” said Zeigler. “When you are targeting their child, or heaven forbid their child might not think the same way as them, it becomes ugly.” Several times, she says, Republican parents called the police on Ossoff volunteers just for ringing their doorbells. During the first round of voting in the special election to fill the congressional seat vacated by Tom Price, Donald Trump’s secretary of Health and Human Services, millennial turnout was weak. “The electorate was almost exactly as old and white as would be expected in a normal midterm electorate,” wrote the New York Times’ Nate Cohn. Ossoff needs young voters—some of whom were away at college for the first round on April 18 but are now home—to go to the polls for the June 20 runoff. So Zeigler, a first-time campaign volunteer, recruited recent graduates from the area’s 51 public and private high schools to mobilize their social networks and track down young Democrats that canvassers hadn’t been able to reach. Recent grads pored over voter lists for names they recognized, contacting former prom dates, next-door neighbors and others to whom they could make direct personal appeals. It’s hard to think of a congressional election with higher stakes, which is why this race has become the most expensive in history. So far, Republicans have faced no electoral consequences for the president’s immense unpopularity. A GOP loss here—in Newt Gingrich’s former district, which hasn’t gone Democratic since 1979—could send Republicans scrambling away from Trump. Thus the right has been pouring money into the race. There’s been a lot of media attention to Ossoff’s massive out-of-state fundraising, most of it from small-dollar donors. But according to Issue One, which tracks money in politics, of the $18.9 million in outside expenditures spent during the runoff, $12 million has gone to support Karen Handel. As Ossoff has moved from underdog to slight favorite, the attacks on him have grown increasingly febrile. One recent TV spot attempted to link Ossoff to the shooting of Rep. Steve Scalise, with a stern voiceover saying: “The unhinged left is endorsing and applauding shooting Republicans. When will it stop? It won’t if Jon Ossoff wins on Tuesday.” Handel denounced the ad but has refused to call for it to be taken down. The fact that Ossoff is doing as well as he is in such a Republican district is testament to his considerable political skill as well as to anti-Trump backlash. People often say he reminds them of Barack Obama, and not just because of his lanky frame. He has a similar unflappability and slightly aloof self-possession, and he seems to speak with a three-second delay as he carefully weighs his words. He’s committed to civil rights—his political mentor is Rep. John Lewis, for whom he interned in high school—but sells himself as a post-ideological problem-solver. Nationwide, many progressives have soured on this sort of technocratic liberalism, but it goes over well in a district that is affluent and among the country’s most highly educated. Still, it’s obviously not just Ossoff’s personal qualities that have inspired women to run themselves ragged on his behalf. At one of Ossoff’s campaign offices on Monday, I met a precinct captain named Martha Bernstein as she prepared to head out canvassing. Now in her 60s, Bernstein told me she’d lived in the 6th District for 39 years and had never before been involved in a political campaign. Trump changed that. Bernstein teaches English as a second language, and she saw what Trump’s victory meant to her immigrant students and their families. “My students look to me for leadership and guidance, and after the presidential election, they and their parents felt very helpless and very hopeless about America,” she told me. When Ossoff entered the race, Bernstein took a leave of absence from work to volunteer for him full-time. “My attempt is to restore their faith in our democracy,” she says of her students. I asked her if she’s optimistic about Election Day. “We’re going to win,” she said decisively. Gesturing at Ossoff, who came over and gave her a hug, she said, “Look what we’ve got!” Her confidence is enviable. For most of the people in the Georgia 6th District who have hurled themselves into the fight against Trumpism, Tuesday is going to be a long night.